A great many mass-marketed lamps (and light fixtures in general) are just cheap looking or ugly, and if they aren’t, the shades are very often the wrong shape or proportions or size for the lamp. “What were they thinking?? ?” are the words I utter most often when I am shopping for lighting. This is especially true for discount stores where, I swear, they just let the stock personnel mix shades and bases at random when they uncrate the merchandise. I just replaced a floor lamp that died. I loved that lamp, but the base had broken in an awkward place so that it refused to stand straight any longer and there was no way to repair it. I found a replacement lamp I liked at a discount store but, true to form, the shade was all kinds of wrong for the lamp. Although the proportions weren’t horrible, the drum shade with its plastic liner was cheap looking and too contemporary for the turned and fluted lamp base. The good news is, the lampshade I bought for my beloved broken lamp suited this one as well. The bell shape and scalloped edge echoes the scalloped carving detail and turned lines nicely. Don’t Judge a lamp by it’s cover! If you find a pleasing lamp base, remember, you can always buy a shade separately. However, keep in mind that good lampshades can range from $30 to over $100 and custom shades, while exquisite, are an even greater investment. We have a wonderful resource for custom shades here in Boston at Blanche P Field, which has been crafting gorgeous shades since 1905 when Mrs. Field, the founder of the company, was called upon to create lampshades for the opulent Newport RI mansions, but, as that last sentence implies…bring wheelbarrows full of money. Selecting the right shade for a lamp base is partly an art, and as such, there is no one right answer, but there are some guidelines to keep in mind that can help. A classic shade is most often white or ivory fabric, usually natural (or faux) silk or linen, and sewn to a frame which is also lined with fabric. The light color of the shade allows light to filter through. On fine custom shades, the hand crafted steel frame is tightly wrapped with muslin or silk and an intermediate layer is added between the face fabric and the lining that moderates the light. Fabric shades come in all sorts of shapes and sizes and are sometimes embellished with pleating or decorative trim. Shades come in softback as described above, and hardback where the frame is replaced by a solid material (often plastic), with varying degrees of success. Hardback shades are cheaper to construct and are often found on shades with more modern silhouettes. There are other shade material choices for different looks – metal, wicker, or paper to name a few. The lampshade attaches to the lamp most commonly with either with a bulb clip or a spider and harp. 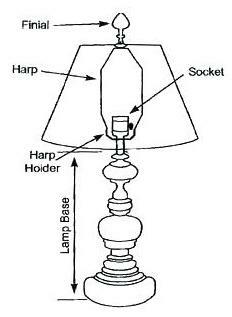 A spider fitting is secured to the harp with a finial (diagrams below via Lamps USA). 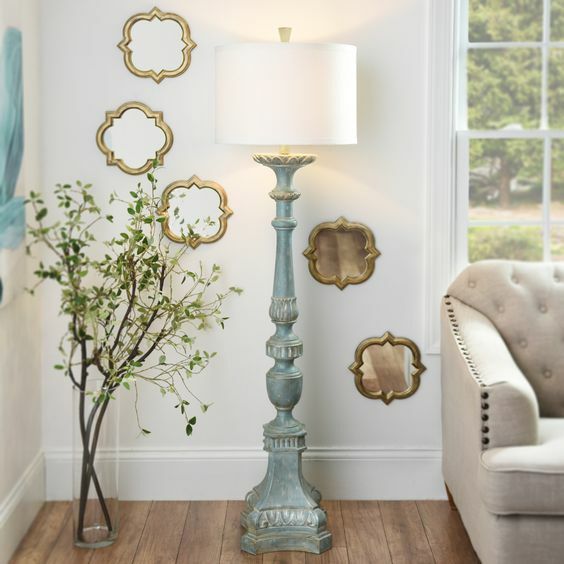 Sometimes lamps come with a decorative finial that matches the base, but if they do not, there are many decorative finials available to complement your lamp and/or room décor. A lampshade is pretty much a hat for the lamp, therefore it should be selected to complement the base in shape and style the same way that a hat is selected to complement an outfit. Curvy urn, ginger jar, or gourd shaped lamps often look best with a classic tapered shade. 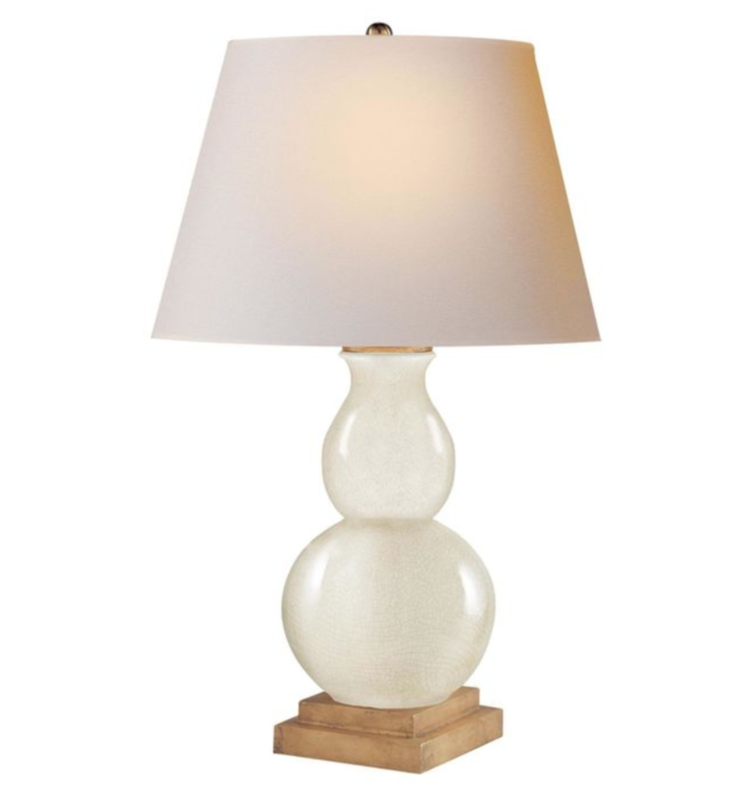 Tall, skinny buffet lamps need smaller, shorter shades to balance without overpowering. Modern lamps are better suited to drum shades, and bases that have a square, rectangular, or oval footprint, can often benefit from shades that mimic the shape in some facet of the design. Floor lamps, like the buffet lamps, need shades that balance the height without looking top-heavy. The lower edge of the lampshade should be wider than the widest part of the lamp base, and the length of the lampshade should cover the socket, switch, and most if not all of the neck. You can buy different size harps to adjust the height of the lampshade on the lamp. For safety, be sure the lampshade sits at least 2”-3” away from the bulb (the higher the wattage, the farther away). Lovely crystal lamps with tailored pleated shades are the perfect finish to this casual blue and white waterfront great room. The next two images show the same glass teardrop lamp base but with two different lampshades. The first bedroom, by Suzanne Kasler, uses a shorter wider lampshade with a shorter harp, and the second bedroom by Phoebe Howard, uses a slightly taller narrower tapered shade. Notice the lower edge of the lampshade covers the neck in both cases, lining up with the top of the teardrop base. And each balances the mass of the base perfectly. The buffet lamps in the rooms below by Joy Tribout show a more contemporary profile. The shorter, smaller shades balance the tall skinny lamps. The first, a gleaming silver, and the second, a twisted black with a black lacquered shade. The ‘candles’ show between the candlestick and the shade in buffet lamps. The buffet lamps below , have more classic tapered shades appropriate to the style of the lamps and the room. This turned and carved wood lamp base from Kirkland (no longer available) has a drum shade which, while the right size proportionately, is not quite right stylistically for the very traditional base - a gracefully tapered shade would complement the base at bit more. The classic shape of the floor lamp below is perfectly accented by the pleated tapered shade. Wishing you a bright month ahead!